Just a plane ride away lies the real fantasy island, Barbados. An island that gives a dreamlike, intimate feeling to your trip. 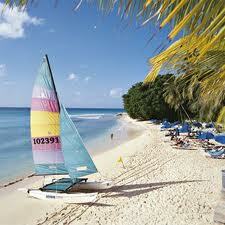 Barbados also offers sun, two seas, and an indescribable richness of colour. The island abounds with exotic locations, while the extensive variety of culture, sports and activities make Barbados the gem of the Caribbean. Barbados is directly accessible from Europe, the US, South America and other regions via Grantley Adams International Airport, which is located in the Christ Church region on the Caribbean island's south coast. Several major airlines operate flights to the destination, including UK operators British Airways and Virgin Atlantic, which provide connections from London and Manchester. Grantley Adams International Airport is located 13km from the centre of Bridgetown, the capital of Barbados. The base is linked to the city, and other destinations to the north and west, via the ABC Highway, which is one of the main local roads available to holidaymakers who opt to use taxi services or hire a car. Barbados is in the Lesser Antilles, an arc of islands that forms part of the Caribbean Sea's eastern boundary with the Atlantic Ocean. The isle covers an area of about 431 sq km and is home to an estimated 284,000 people, with some 80,000 living in or around Bridgetown. The Spanish and Portuguese visited Barbados in the 15th and 16th centuries, before permanent settlers arrived from England in 1627. The island became an independent nation and Commonwealth realm in the 1960s but retains Queen Elizabeth II as its head of state. Holidaymakers visiting Barbados can take the opportunity to learn more about the destination's rich culture, customs and traditions, which draw from the nation's British, African and West Indian roots. The island is one of the leading tourist hotspots in the Caribbean and offers all of the sun, sea, sand and luxury one would expect in this famous region. 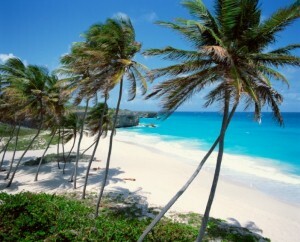 Visiting beaches will be at the top of many travellers' 'to do' lists on a trip to Barbados. The island offers more than 70 miles of seaside retreats, including Crane Beach in St Philip, which is often listed among the top ten locations of its kind in the world. The west coast is ideal for people looking for calm waters and white-sand beaches, while the east offers more dramatic conditions and sights including coral formations. Watersports are also highly popular, with Folkestone Marine Park on the west coast and Carlisle Bay on the south shore offering snorkelling opportunities. Adventurous visitors can have a go at surfing or set off on a boat trip from Bridgetown to swim in deep waters and interact with sea turtles. Among the most impressive spectacles in Barbados is Harrison's Cave, which is one of the destination's best-known natural history sites. The three-mile cave complex is home to beautiful rock structures that offer an insight into the formation of the island itself. Alongside its natural features, Barbados boasts plenty of man-made and historic attractions, such as the Sunbury Plantation House & Museum, which dates back to the 1660s. Burnt down once and renovated twice, the property offers public viewing of all of its rooms. Visitors can also explore local heritage at the Barbados Museum, which is housed in a former military prison in Bridgetown. No trip to this Caribbean island is complete without a taste of rum, which was first made some 370 years ago from local sugar cane and quickly became popular with British sailors. Holidaymakers can relax with some rum punch on the beach or learn more about the beverage, its history and how it is made at the Mount Gay distillery and visitor centre. Barbados visitors with a taste for spicy foods can try flying fish - the symbol of the island - fried with a yellow sauce prepared using exceptionally hot Scotch bonnet peppers, onions and mustard. There are plenty of more mellow flavours and dishes on offer, such as locally caught tuna, crab and red snapper. Barbados boasts a tropical climate with warm, sunny conditions throughout the year. North-east trade winds ensure that it does not get too hot despite the sun and clear skies, with average daytime highs ranging from 23 to 29 degrees C.
The months from January to June are the driest of the year.